About this time every year I tend to start thinking about my father. This is partly because it will soon be Fathers’ Day, but it is mainly because it is coming up for the anniversary of his death. 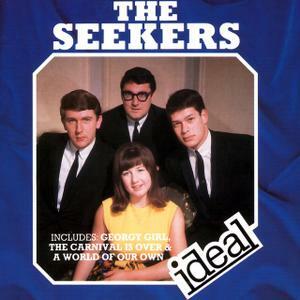 When my father was young, younger than I am now, he liked The Seekers, and at some point in the 80s or 90s he got one of my brothers to copy his collection of Seekers 45s onto audio cassette so he could listen to them in the car. I have many memories of being driven up and down Northern Irish motorways with The Carnival is Over, I’ll Never Find Another You, and Some Day One Day playing in the background, or sometimes in the foreground. A couple of months ago, Michael and I moved from Belfast to Gibraltar. Moving a few kilometres across a city is stressful enough at the best of times. Moving 2,ooo km across a continent takes that to a whole new level. So far it seems like it has been worth it. We both love living here, and I am not even sure where my anti-SAD light box is any more. On the downside, the move has exposed some unexpected difficulties in relationships that I thought were very sound. People I thought were dear and valued friends perhaps seem to have valued me less than I valued them. In work I have been listening to The Seekers to remind me of Dad. One of the songs on the playlist was Turn! Turn! Turn!, a song based on Ecclesasties 3. That has always been a difficult chapter for me to understand. It seems to be so negative and so positive at the same time. Listening to The Seekers singing it one line jumped out at me, and suddenly I understood what The Preacher was writing about. There are people in my life who I have embraced in the past, and now it seems like it is time to refrain from embracing them. The message that I couldn’t understand is actually very simple. In Ecclesasties, The Preacher was telling us that life has ups and downs. To every thing there is a season. Good times and no-so-good times, times to laugh and times to weep, are part of life. The time may come when old friendships will flourish again, but if they don’t, well, To every thing there is a season, and a time to every purpose under the heaven.